I was inspired and humbled by Niel Cocker’s post on taking action after reading my Open Letter to Brad Feld. I think it is only fair that I state clearly what I intend to do with the Startup Iceland movement. 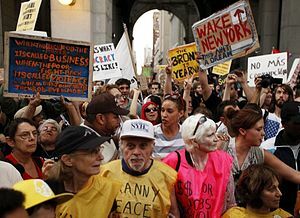 I think this is the kind of grass root movement I wish the Occupy Wall Street transforms into. Urging people to move forward with ideas that create communities centered around value creation. I wish more local communities would join this movement… I call it Occupy Entrepreneurship Movement. History has taught us that revolutions are needed to move societies forward and I am starting to see that within the Entrepreneurs. Everyone one of them I meet want to create, build, change and improve something that is broken or does not exist. They are not looking for someone to hand them a favor, they are rolling their sleeves and doing it. I never hear an Entrepreneur tell me “Its not my job!”. This simple act inspires me. Like Niel, like Gunnar and hundreds of companies and entrepreneur in Iceland. Startup Iceland will be a one stop resource shop for Entrepreneurs, I want to model it based on the Startup America Partnership, I think they are doing a wonderful job. I have already started on the design of the website, it is temporarily pointing to my blog. I have a very talented design team working on the concept and I am confident that it would be awesome. We will organize a yearly event in Iceland centered around Startups, Entrepreneurship and Venture Investing, although it is hosted in Iceland it will be open to the world to participate and we will get the best of the best to come and share their ideas, stories and learning to build on our collective experiences. We have to put the Harpa Concert Hall to use. We will run all activities of Startup Iceland with the Open Source principles. I have already written about what I think is needed in the Startup Community in Iceland, but I want to open the discussion to the community so everyone can contribute to the thought process, Startup Iceland will provide the platform for that.